Following the successful election campaign in 1976, Zbigniew Brzezinski, Carter’s principal foreign policy advisor, was appointed National Security Advisor on 20 January, as the president’s administration officially began. Having previously served as a counsellor to Lyndon B. Johnson between 1966 and 1968, ‘Zbig’ was already an influential player in the foreign policy community. Together with David Rockefeller, he co-founded the Trilateral Commission – a globally-focused foreign policy think-tank – serving as director from 1973 to 1976, while also a long-standing member of the Council on Foreign Relations and Bilderberg group. Additionally, Brzezinski worked at Harvard University from 1953 to 1960, before switching to Columbia, where he served until 1989. As Carter’s National Security Advisor, Brzezinski faced multiple challenges during his four-year tenure. Before his term had even begun, workers’ strikes had broken out in Poland, eventually leading to the Solidarity movement. His support for the Polish group was one aspect of his agenda on the USSR, while his advocacy of arming Afghan rebels against the invading Soviet forces was another. Much of his efforts were spent on the SALT II negotiations, which aimed to reduce US and USSR production of nuclear weapons. Although the treaty was signed in 1979, the Soviet invasion of Afghanistan meant that it was never ratified by the US senate. Additionally, Brzezinski is also known for his role in securing the 1978 agreement between Israeli Prime Minister Menachem Begin and Egyptian President Anwar Sadat, to solidify the Camp David peace accords, as well as the normalisation of relations between the US and the People’s Republic of China (PRC). Such efforts are embodied by the US’ decision in 1979 to acknowledge the PRC as ‘China’, rather than the Taipei-based Republic of China. 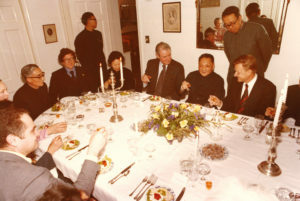 Zbigniew Brzezinski (right) hosts Chinese leader Deng Xiaoping (centre) for a private dinner at his home outside Washington, DC. 30 January, 1979. Earlier this year, Brzezinski died at the age of 89, leading to numerous public tributes to his life and actions. Carter commended his career, stating that “one of the best things that ever happened to the United States of America was having him in the forefront of shaping our foreign policy”. The former president added that Brzezinski was “the most brilliant person that I have ever known”. Former US Secretary of State Madeleine Albright – mentored by Brzezinski – said that he was one of America’s “most important national security leaders – a man whose actions helped define American foreign policy during the Cold War and whose ideas still influence policymakers today”. She added that Brzezinski’s “public service and relentless advocacy for US leadership made America more secure and the world a better place”. Brzezinski’s death also resonated strongly in Poland. Witold Waszczykowski, Polish foreign minister, said that “the world has lost an outstanding intellectual, an experienced and effective diplomat, as well as an honourable man and a proud Pole”. President Andrzej Duda praised Brzezinski as “the voice of free Poland” in the White House, while former foreign minister Radek Sikorski hailed him as ‘our statesman’ and one of the “most important voices for a free Poland abroad”. After liberation, Sikorski added, Brzezinski “acted as an advisor and champion of the new democracies on their way to re-joining Western institutions”. 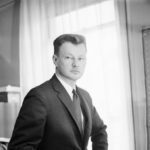 Zbigniew Brzezinski was born in Warsaw in March 1928, although his family originated from Brzeżany (now Berezhany, Ukraine). As a young child, he lived in both early Nazi Germany and Stalin’s USSR due to his father’s diplomatic postings. In 1938, his father was appointed as consul general in Montreal and, following World War Two, he obtained a BA and MA from Montreal’s McGill University, before going on to earn a Ph.D. from Harvard. He became a US citizen in 1958 and continued teaching, while also becoming a prolific foreign policy writer and advisor for the Democrat party. Following his tenure as National Security Advisor, Brzezinski returned to teaching, but remained active in foreign policy analysis until his death. Former National Security Advisers meet with President Barack Obama. Zbigniew Brzezinski on the right. Washington, 2010. Brzezinski and Israeli Prime Minister Menachem Begin play chess during Camp David Accords. 9 September, 1978. Zbigniew Brzezinski with Soviet President Mikhail Gorbachev. President Ronald Reagan in the back. New York, 7 December, 1988. Zbigniew Brzezinski shares a laugh with President Jimmy Carter aboard Air Force One. Zbigniew Brzezinski briefs President Jimmy Carter. Liam Frahm is Poland Today’s editorial co-ordinator and is based in the United Kingdom. He currently studies politics, philosophy and economics at Oxford University and is interested in current and international affairs.